Today, SellerActive is releasing a major software upgrade. You’ll see a number of changes in this new iteration, including new workflows, tools, and features that make listing products on major marketplaces fast, easy, and efficient. Here’s a breakdown of what you can expect. Read the launch announcement from our CEO Jason here. To build the most important part of this release, we took our existing set of features, and incorporated previously missing features into a new concept we call Workspaces. Our first two workspaces are designed to simplify and optimize the workflows involved in managing your product catalog, and to sync listings and offers with marketplaces faster and easier than other tools available. The Products Workspace is home to your product catalog. Here you’ll find basic information about your products such as SKU, cost, quantity, but also more advanced capabilities to support variations, kits, bundles, vendors, and FBA. This is where you can quickly create new products, or modify existing products all at once and have your changes immediately reflected across multiple channels. The Listings Workspace replaces our legacy “Pricing Manager” page, and acts as the hub for your marketplace listings and offers. You will also find basic product information here, coupled with important channel-specific data such as price, sale price, shipping policies, pricing strategies, Buy Box status, competitor data, and more. We believe our new Workspaces will allow for a single listing workflow that works seamlessly across your most important sales channels. We know sellers comes in all shapes and sizes, so we focused on the features and channels that bring sellers the highest return on their investment. We are excited to expand from here with new features and supported channels in the future. We know sellers will need to switch between workflows, so we made this process as painless as possible by creating a feature native to both Products and Listings. Introducing the SkuPane: an area where you can quickly interact with a product, listings, and their associated inventory, bundles, and variations; all without ever switching between Workspaces. We are excited to share the first version of SkuPane with sellers, and feel it fills a big need in the market. In upcoming releases we will be further enhancing the capabilities and would love to hear your feedback. Our goal is to further revolutionize the way sellers manage the most important aspects of their multichannel business and believe the concept of a SkuPane will play an important part in doing so. We are beyond excited to announce that we have completely redesigned our eBay listing process. No more cumbersome, category-specific upload templates! The new process is fully supported in the new workspaces and works just like listing to Amazon or Walmart, so get ready to quickly and efficiently list to the three biggest marketplaces in the US. In the new SellerActive, you’ll be able to create new and first-to-market products for sale on marketplaces. If you are a brand or just the first to sell a product on a marketplace, we’ll help you get it categorized and listed, so you can be selling before the competition catches up. Most multichannel listing tools don’t offer this service. Why? Because it’s very hard to do accurately across multiple channels and product categories. It takes years of experience to understand and develop a process to allow for new product publication across multiple marketplaces and verticals. Our product creation also includes repricing technology to keep your product pricing optimized uniquely on each channel. We decided to take this challenge on because we believe that merchants holding branded, and first-to-market products with market demand will have the greatest chance of success on increasingly competitive channels. We want to help them get their products listed quickly and priced intelligently. As of this release, our production creation service will support Amazon, eBay, and Walmart. However, we will have other channel support coming soon. We’ve rolled out numerous architecture upgrades that support and scale the new application. These changes mean much faster overall load times, and filtering, sorting, searching will feel faster than ever. We’re offering new filters that stick, so you can drill down your full catalog to just a few specific parameters, and then come back to your saved workflow when you next need it. We also have new built-in quick filters, which can save time on your most common tasks. We’re also presenting a new approach to our pricing structure by introducing new tiers, and base prices that suit every business. We’ve also made our pricing more flexible, and some of our tools are now available à la carte rather than the all-in-one approach. Don’t use ‘em? Don’t pay for ‘em! There's no better way to learn about the new SellerActive than to schedule a free demo with our knowledgeable team. 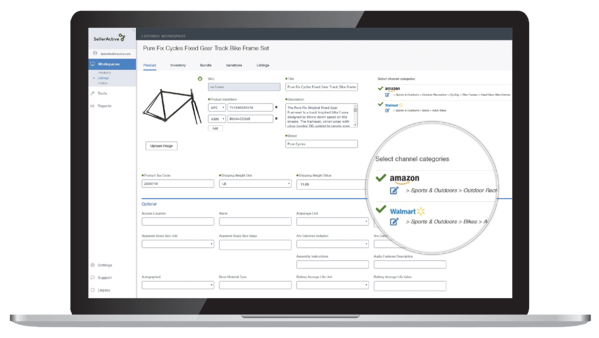 In your demo call, we'll take you through the new application, familiarize you with Workspaces, and show you how easy it is to list products to Amazon, Walmart, and eBay. Ready to get started?